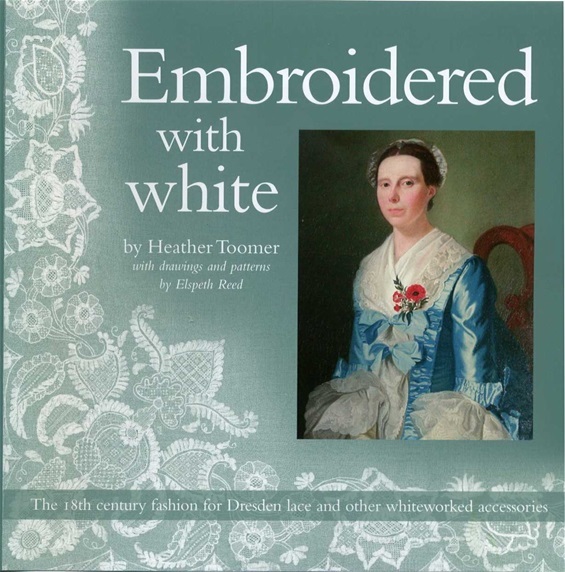 180 pages with over 300 colour and black and white illustrations of original 18th century whiteworked accessories, portraits and costume plates showing how they were worn, and 20 accurate patterns to facilitate reproduction of many examples. the period and how designs and stitches changed from about 1710 to 1800. Kerchiefs, aprons, sleeve ruffles and waistcoats are all included together with a sprinkling of allied articles, such as bags, pockets and stomachers. Photographs show a wide range of original items including details of the embroidery stitches, together with portraits and costume illustrations. It is hoped these will provide inspiration for embroiderers and fashion designers alike, while measurements and patterns will be helpful to those involved in accurate reproductions for stage, screen etc. Tips are given on washing and conservation. There is also information on where original items may be studied in public collections. This book will be of interest to anyone concerned with the care and cataloguing of a costume or embroidery collection, embroiderers and other designers seeking inspiration, costume and general social historians and anyone with a love of fine craftmanship. Prices including postage: £19.75 within the U.K.; £26 to Europe; £30 including postage to the U.S.A. and Canada; £30.50 to Australia. Please email me on htac2000@gmail.com to ask for costs of postage elsewhere or combined charges for several books. Thank you for your interest. Please give me your E.mail address so that I can sen you an invoice. Heather I would like to buy the Embroidered with White book I can pay with paypal. I want to order a copy of Embroidered with White. Please inform me how I can trnsfer the amount due for postage to Europe.